The atmosphere surrounding a race is also a hugely important factor for most runners, and the atmosphere at the Reykjavík race is electric. While the Icelanders would enthusiastically support the race anyway, it is actually planned to coincide with 'Culture Night' (Menningarnótt), a national event that brings up to a third of the entire population of Iceland onto the streets of the capital. Another obvious reason to run is the city itself: the Viking name, Reykjavík, may literally translate as 'smoky bay', but the name in fact refers to the steam rising from Iceland's many geothermal springs. Reykjavík actually has some of the cleanest air of any city. Situated on a peninsula, water features heavily in the self-proclaimed 'Party Capital of the North', with the old-town even nestled around a large pond called Tjörnin. Teeming with birdlife, Tjörnin is like an oasis in the maze of old wooden houses covered in colourful corrugated iron that comprise downtown. Reykjavík has the very unusual feel of a modern international city trying to fit into a nineteenth century fishing village. The race offers an atmosphere which is both relaxed and welcoming. Around 1,000 runners participate in the marathon and 2,000 in the half marathon, making both races less crowded than is generally the case in larger events. 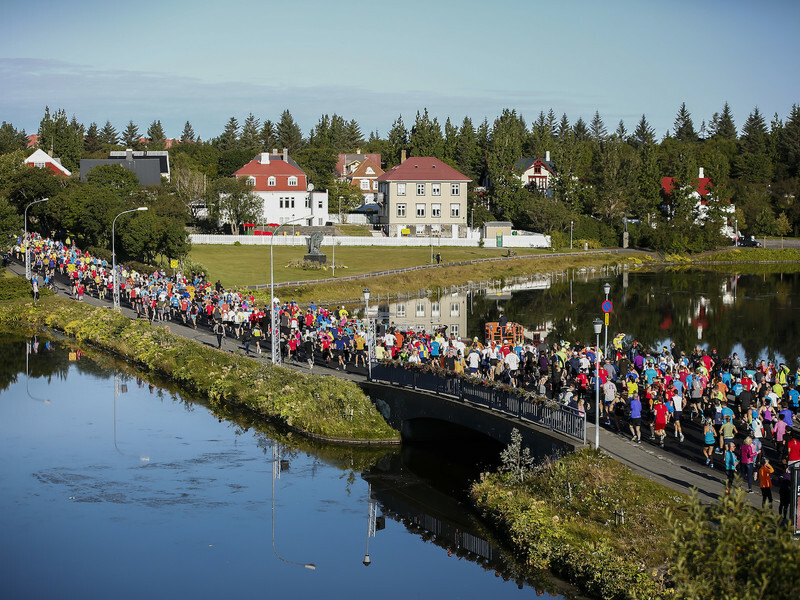 Since the Reykjavik Marathon also includes 10k, fun run and children's run distances, it's also a family event. Although only around 200,000 people live in the larger Reykjavik area, large crowds gather in the streets to support the runners. However, parts of the course pass through uninhabited areas where there are few spectators, instead giving the runners a chance to enjoy Iceland's natural environment and the spectacular scenery. The marathon passes through downtown Reykjavik, a residential area, near a salmon river, and along the beach.